Fiddleheads hunting…in search of the elusive but delicious fern! A cluster of fiddleheads as they emerge from the damp, stream-side earth. Fiddleheads are one of the joys of spring here in the North Maine Woods. There is a short window of time in the spring when you can find fiddleheads that are prime for eating. If they get to large, they are bitter and definitely not fine dining. 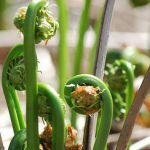 If you would like to know more about finding and harvesting fiddleheads, just click here and read our post from last year’s fiddlehead “harvest”. And if you would like more traditional Maine Fiddlehead recipes, click here. That post contains some premium fiddlehead recipes with info on freezing, canning, and cooking fiddleheads. I’ll be adding some new fiddlehead recipes to the blog this year. One is a absolutely delightful soup we discovered on one our weekend trips to Nova Scotia. Discovering the restaurant of Canadian Chef Craig Flinn was like finding the culinary pot of gold at the end of the rainbow! You just can’t imagine how delicious this is! 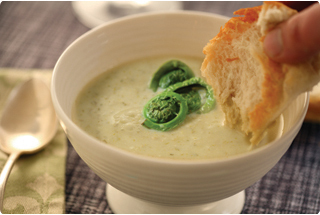 Fiddleheads made into a creamy soup … it’s a good thing! I discovered this incredibly delicious dish at Chives Canadian Bistro in Halifax, Nova Scotia. 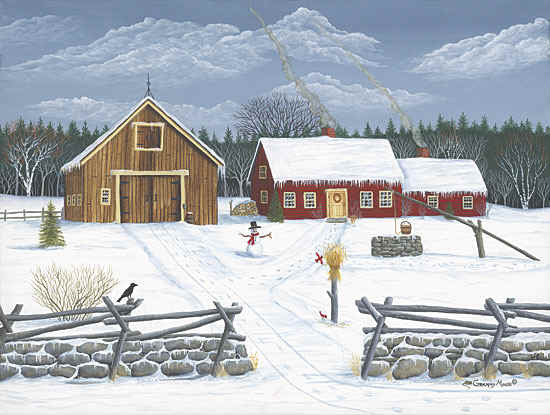 Bill and I love going to Nova Scotia for getaway weekends. Exploring the island is so much fun. 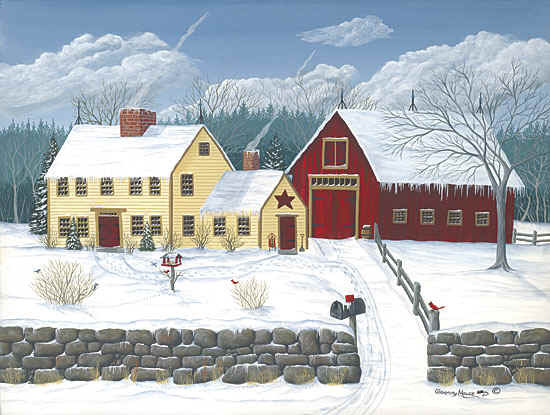 It is breathtakingly beautiful and charmingly quaint. One of our best culinary finds was Chef Flinn’s delightful little bistro. His cooking philosophy is fresh, local, in-season ingredients and it can’t be more fresh or local than fiddleheads in the spring. This recipe is in the Chef Craig Flinn’s cookbook – Fresh & Local: Straight form Canadian farms to your table, which you can purchase by clicking here. The cookbook is well worth the money with great recipes. I love the one for Pickled Asparagus. Asparagus, like fiddleheads, is another fleeting springtime delight and it’s great when you can find recipes to use to preserve that great flavor for later in the season. Chef Craig Flinn’s Fiddlehead Soup tradition! Warming, comforting, and delicious, this soup is made of fresh, local ingredients. If you don’t have fiddleheads available in your area, head to Nova Scotia and visit “Chives”! Sauté onion, celery, garlic, thyme, salt, and pepper in olive oil and butter over medium heat for 5 minutes. Deglaze the pan with white wine and bring to a boil. Add fiddleheads and stock and simmer for 20 minutes. I ran across fiddleheads in New Brunswick; for a month or so, they are so plentiful you can’t give them away. I made a fiddlehead soup according to my own instincts, and it probably wasn’t as good as the one you present here. I will remember your recipe, and try it the next time I am in NB. PS: I had heard of fiddleheads before, and even tried them sautéed in butter and garlic. But since then I have developed a taste for good vegetable soups, I grew up in rural Indiana, and our specialty there was Morrell mushrooms. Fiddlehead season is almost upon us. I so love them. One of Bill’s and my favorite thing to do in the spring is to go trout fishing. We always pack a cast iron fry pan and some olive oil in our backpack. Sauteing fresh trout and fresh fiddleheads in the wild over a campfire is a treasured spring tradition with us. I did not know you could EAT fiddleheads! Wow! Thanks so much for taking the time to link up with us over at the #HomeMattersParty – we hope to see you again on Friday 🙂 Feel free to bring a friend or two! Great to see some use of wild edibles. I love to play “hunter/gatherer” and use what we have available in the wild. Fiddleheads and trout are spring favorites here in Maine. When we go fishing we take our cast iron fry pan into the woods and cook up an impromptu meal of the two spring delicacies right over a campfire. I’ve always wondered how to use fiddleheads! So cool. Thanks for sharing on Share the Wealth Sunday. Now that you know hopefully you’ll give them a try! Most recipes for asparagus work for fiddleheads. I never heard of it! The soup looks yummy though! ohhh i have heard of and seen recipes for these fiddleheads but haven’t tried them – yet. This fiddle head soup sounds delish!! I’ve never heard of fiddleheads, but this last year I tried Chicken of the Woods mushroom soup. Oh my! Delicous! Thanks for sharing with The Clever Chicks! Someday when I visit somewhere that serves fiddleheads, I’m going to have to try them. Thanks for sharing on Merry Monday Link Party. This is just fascinating to me! How cool! I’ve never had fiddlehead soup before but this sure looks delicious! Thanks for the recipe! Went fiddlehead picking yesterday. I’m going to make this, or something close to it. Thanks for the inspiration. Glad your inspired! I love fiddleheads but I do hate cleaning them! Do you have any special tricks for getting rid of those brown, papery skins? When fiddleheads are dry after picking- no dew or rain, the same day I put them in one of those kiddy pools and with an air compressor nozzle and hose I blow the orange parchment like sheath over the side or to the opposite side of the pool since it is lighter than the fiddleheads where I can collect and compost it. This technique has worked well for me the past 8 or 10 years. Then I, of course, rinse them in cool water a couple of times, but they are pretty darn clean by then. We just picked this week and it is getting late in the season but where we pick they tend to be late and we still got a good mess of fiddleheads- tho had to look harder since a lot were already knee high. It was damp with the rain of late so my blowing air technique did not work for cleaning so it was into the wash pan with them. But since it is late in the season and they were more up from the ground (when it really is the best time to pick them) there was less “chaff” than when picking earlier. So two rounds thru the rinse pan still worked just fine with a reasonable amount of picking and breaking off long ends. The most annoying thing was there had been a frost recently and so there were dark ones to sort out. By the way, I’ve never found that picking late in the season that fiddleheads get bitter. They DO get unfurled and SMALLER, but I’ve never tasted a bitter fiddlehead in over 60 years of picking them. I plan to make the fiddlehead soup recipe tonight and as you say, it is much like an asparagus soup I make. Should be good! Thanks. Fiddleheads are such a delight. Wish they were available fresh year round. Thanks for all the tips on finding, picking, and cleaning. My readers are going to enjoy the information you give from your years of experience! I have never even heard of fiddle-heads before. Looks and sounds like I have been missing out!!! I had no idea that you ate fiddleheads! Hmm.. I’ve never had fiddle heads before but I’ve seen them used a lot on cooking shows. If I ever get the chance I’ll definitely give them a try 🙂 Thanks so much for sharing with us at Weekend Wonders. Hope you’re enjoying your week so far. I had no idea that there was a type of fern that was edible. I have ferns in my garden that unfurl just like this. Of course, I would never chance eating them. Really interesting and looks delish! Thanks for sharing with Share Your Cup. Well, that will depend on where you live! You can go track them down in the woods as I describe in this post –http://www.wildernesswife.com/in-search-fo-the-elusive-fiddlehead/ or often you can find them in larger super market chains, but only in the spring. The window of time to enjoy them is short so don’t delay! I can’t wait to try this recipe. I see fiddleheads at our markets but I’ve never know what to do with them. Pinning. Be sure to check out the links in the post as there are more Fiddlehead recipes on my blog. 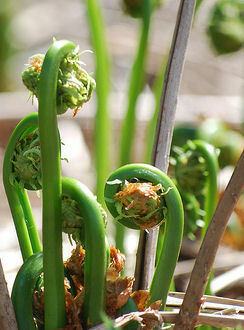 Fiddleheads are similar to asparagus and most recipes that work for asparagus also work for fiddleheads. I have always wondered about fiddleheads. Thank you so much for sharing on Show Me Your Plaid Monday’s! We used to pick fiddleheads every year when we were kids, right around Mother’s Day. I love them steamed with vinegar, butter, salt and pepper. Your soup recipe sounds delicious, I’m going to try it! Thank you for linking up with the Clever Chicks Blog Hop this week, I hope you’ll join us again! Looks so yummy!!! 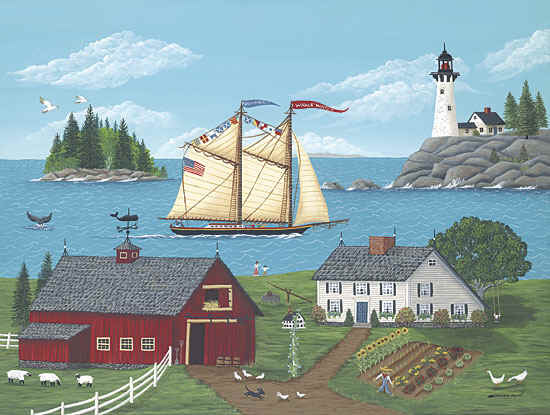 I’m about to head to Maine this week! (Portland) Maybe I will seek out some of this soup while I am there. Thank you for sharing! Hope you find some to try! You’ll love it! It is a unique mountain and Baxter State Park is “forever wild”. I have a number of friends who live in Woodville. I bet we know some of the same people! I am intrigued. I’ve never heard of eating fiddleheads. Now I think I need to come to Maine in April so I can experience it. That’s a great idea….actually there are thousands of reasons to visit Maine but spring, also known here as “Mud Season”, is a little hard to promote with tourists. But you’ve given me a great idea, we could have a “fiddlehead festival” in the spring! Have only ever had fiddlehead ferns once when Norman and I did a trip up state New York. Sorry can’t remember where it was exactly, the name of the Restaurant was the Fiddlehead Fern. Fiddlehead ferns are not availabl in New Zealand. I’m another one who never heard of such a yummy treat. There is no way I will find them in southern California! Probably not, they are the ostrich fern. You can also eat the cinnamon fern and the brake fern when they are in their fiddlehead stage but the true Fiddlehead fern is the Ostrich Fern. Until we started spending time in Maine I didn’t know fiddleheads but have come to like them in a variety of ways. I haven’t tried them in soup but that sounds really good. BTW, I am half the year in Rockport. I haven’t had these before but they intrigue me because they are just too cute! Not only are they cute but very, very tasty. You can often find them in grocery stores in the spring. Try them! Wow, that’s amazing. I never heard of it! The soup looks yummy though! I remember eating fiddleheads at my aunt & uncle’s every year (we lived in Vermont). She served them various ways. One of my favorites was in a cream sauce over toasted English muffins. It’s probably been 25+ years since I’ve had them and I still remember how delicious they were! I’m sending her a link to your blog! Pretty much any recipe that works for asparagus will work with fiddleheads. They are great with Hollandaise sauce or even just as simple as steamed wand served with butter and lemon juice. fiddleheads!! found this on the i should be mopping the floor link party… when i saw it, i wondered if you were from maine. i grew up here, lived in dallas for 7 years and married a texan. we moved back to maine a couple of years ago and my husband is in love with fiddleheads! need to make this recipe. thanks for sharing! love your blog! Be sure to check the recipes and info on the other two pages in the links. Fiddleheads have so many ways to use them. I put them in quiche, dips, saute them, pickle them, roast them…a very versatile vegetable and a gift from mother nature! Well, welcome back to Maine, Heaven on Earth in my humble opinion! A Texan in love with Fiddleheads, that is so cool! There’s so many ways to eat them! Now you have to take him out fiddleheading to gather his own! Oh I loooooooove fiddleheads. Yum!